1 Like a hind which pants after the water-brooks, So pants, my soul after Thee, O God. 2 My soul thirsts for God, for the living God; When shall I come and appear before God? 3 My tears have been bread to me day and night, While they say to me all the day, Where is thy God? 4 This would I remember, and pour out my soul in me, How I went with the throng, led them in procession to the house of God, With shrill cries of joy and thanksgiving, a multitude keeping festival. 5 Why art thou bowed down, my soul, and moanest within me? Hope in God, for I shall yet give Him thanks, [As] the help of my countenance and my God. 6 Within me is my soul bowed down; Therefore let me remember Thee from the land of Jordan and of the Hermons, from Mount Mizar. 7 Flood calls to flood at the voice of Thy cataracts; All Thy breakers and rollers are gone over me. 8 [Yet] by day will Jehovah command His loving-kindness, And in the night shall a song to Him be with me, [Even] a prayer to the God of my life. 9 Let me say to God my Rock, Why hast Thou forgotten me? Why must I go mourning because of the oppression of the enemy? 10 As if they crushed my bones, my adversaries reproach me, Whilst all the day they say to me, Where is thy God? 11 Why art thou bowed down, my soul, and why moanest thou within me? Hope thou in God, for I shall yet give Him thanks [As] the help of my countenance and my God. 1 Do me right, O God, and plead my plea against a loveless nation; From the man of fraud and mischief rescue me. 2 For Thou art God my stronghold; why hast Thou cast me off? Why must I wearily go mourning because of the oppression of the enemy? 4 That I may come in to the altar of God, To God, the gladness of my joy, And give Thee thanks with the harp, O God, my God. 5 Why art thou bowed down, my soul, and why moanest thou within me? Hope in God, for I shall yet give Him thanks, [As] the help of my countenance and my God. The second book of the Psalter is characterised by the use of the Divine name "Elohim" instead of "Jehovah." It begins with a cluster of seven psalms (reckoning Psalms xlii. and xliii. as one) of which the superscription is most probably regarded as ascribing their authorship to "the sons of Korach." These were Levites, and (according to 1 Chron. ix. 19 seq.) the office of keepers of the door of the sanctuary had been hereditary in their family from the time of Moses. Some of them were among the faithful adherents of David at Ziklag (1 Chron. xii. 6), and in the new model of worship inaugurated by him the Korachites were doorkeepers and musicians. They retained the former office in the second Temple (Neh. xi. 19). 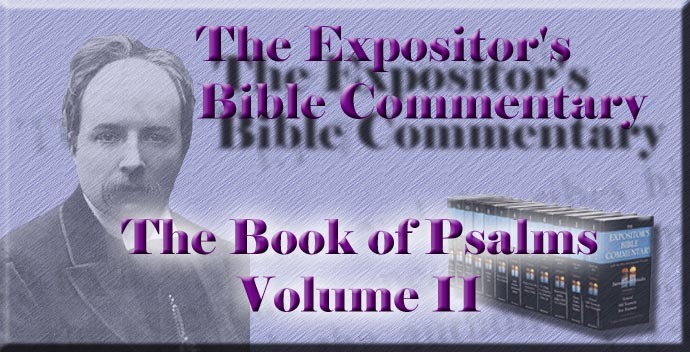 The ascription of authorship to a group is remarkable, and has led to the suggestion that the superscription does not specify the authors, but the persons for whose use the psalms in question were composed. The Hebrew would bear either meaning; but if the latter is adopted, all these psalms are anonymous. The same construction is found in Book I. in Psalms xxv.-xxviii., xxxv., xxxvii., where it is obviously the designation of authorship, and it is naturally taken to have the same force in these Korachite psalms. It has been ingeniously conjectured by Delitzsch that the Korachite Psalms originally formed a separate collection entitled "Songs of the Sons of Korach," and that this title afterwards passed over into the superscriptions when they were incorporated in the Psalter. It may have been so, but the supposition is unnecessary. It was not exactly literary fame which psalmists hungered for. The actual author, as one of a band of kinsmen who worked and sang together, would, not unnaturally, be content to sink his individuality and let his song go forth as that of the band. Clearly the superscriptions rested upon some tradition or knowledge, else defective information would not have been acknowledged as it is in this one; but some name would have been coined to fill the gap. The two psalms (xlii., xliii.) are plainly one. The absence of a title for the second, the identity of tone throughout, the recurrence of several phrases, and especially of the refrain, put this beyond doubt. The separation, however, is old, since it is found in the LXX. It is useless to speculate on its origin. There is much in the psalms which favours the hypothesis that the author was a Korachite companion of David's in his flight before Absalom; but the locality, described as that of the singer, does not entirely correspond to that of the king's retreat, and the description of the enemies is not easily capable of application in all points to his foes. The house of God is still standing; the poet has been there recently, and hopes soon to return and render praise. Therefore the psalm must be pre-exilic; and while there is no certainty attainable as to date, it may at least be said that the circumstances of the singer present more points of contact with those of the supposed Korachite follower of David's fortunes on the uplands across Jordan than with those of any other of the imaginary persons to whom modern criticism has assigned the poem. Whoever wrote it has given immortal form to the longings of the soul after God. He has fixed for ever and made melodious a sigh. The psalm falls into three parts, each closing with the same refrain. Longings and tears, remembrances of festal hours passed in the sanctuary melt the singer's soul, while taunting enemies hiss continual sarcasms at him as forsaken by his God. But his truer self silences these lamentations, and cheers the feebler "soul" with clear notes of trust and hope, blown in the refrain, like some trumpet-clang rallying dispirited fugitives to the fight. The stimulus serves for a moment; but once more courage fails, and once more, at yet greater length and with yet sadder tones, plaints and longings are wailed forth. Once more, too, the higher self repeats its half-rebuke, half-encouragement. So ends the first of the psalms; but obviously it is no real ending, for the victory over fear is not won, and longing has not become blessed. So once more the wave of emotion rolls over the psalmist, but with a new aspect which makes all the difference. He prays now; he had only remembered and complained and said that he would pray before. Therefore now he triumphs, and though he still is keenly conscious of his enemies, they appear but for a moment, and, though he still feels that he is far from the sanctuary, his heart goes out in hopeful visions of the gladness of his return thither, and he already tastes the rapture of the joy that will then flood his heart. Therefore the refrain comes for a third time; and this time the longing, trembling soul continues at the height to which the better self has lifted it, and silently acknowledges that it need not have been cast down. Thus the whole song is a picture of a soul climbing, not without backward slips, from the depths to the heights, or, in another aspect, of the transformation of longing into certainty of fruition, which is itself fruition after a kind. Perhaps the singer had seen, during his exile on the eastern side of Jordan, some gentle creature, with open mouth and heaving flanks, eagerly seeking in dry wadies for a drop of water to cool her outstretched tongue; and the sight had struck on his heart as an image of himself longing for the presence of God in the sanctuary. A similar bit of local colour is generally recognised in ver. 7. Nature reflects the poet's moods, and overmastering emotion sees its own analogues everywhere. That lovely metaphor has touched the common heart as few have done, and the solitary singer's plaint has fitted all devout lips. Injustice is done it, if it is regarded merely as the longing of a Levite for approach to the sanctuary. No doubt the psalmist connected communion with God and presence in the Temple more closely together than they should do who have heard the great charter, "neither in this mountain, nor in Jerusalem"; but, however the two things were coupled in his mind, they were sufficiently separate to allow of approach by longing and prayer while distant in body, and the true object of yearning was not access to the Temple, but communion with the God of the Temple. The "soul" is feminine in Hebrew, and is here compared to the female deer, for "pants" is the feminine form of the verb, though its noun is masculine. It is better therefore to translate "hind" than "hart." The "soul" is the seat of emotions and desires. It "pants" and "thirsts," is "cast down" and disquieted; it is "poured out"; it can be bidden to "hope." Thus tremulous, timid, mobile, it is beautifully compared to a hind. The true object of its longings is always God, however little it knows for what it is thirsting. But they are happy in their very yearnings who are conscious of the true direction of these, and can say that it is God for whom they are athirst. All unrest of longing, all fever of thirst, all outgoings of desire, are feelers put out blindly, and are only stilled when they clasp Him. The correspondence between man's needs and their true object is involved in that name "the living God"; for a heart can rest only in one all-sufficient Person, and must have a heart to throb against. Neither abstractions nor dead things can still its cravings. That which does must be living. But no finite being can still them; and after all sweetnesses of human loves and helps of human strengths, the soul's thirst remains unslaked, and the Person who is enough must be the living God. The difference between the devout and the worldly man is just that the one can only say, "My soul pants and thirsts," and the other can add "after Thee, O God." This man's longing was intensified by his unwilling exile from the sanctuary, a special privation to a door-keeper of the Temple. His situation and mood closely resemble those in another Korachite psalm (lxxxiv. ), in which, as here, the soul "faints for the courts of the Lord," and as here the panting hind, so there the glancing swallows flitting about the eaves are woven into the song. Unnamed foes taunt the psalmist with the question, "Where is thy God?" There is no necessity to conclude that these were heathens, though the taunt is usually put into heathen lips (Psalms lxxix. 10; lii. 2) but it would be quite as natural from co-religionists, flouting his fervour and personal grasp of God and taking his sorrows as tokens of God's abandonment of him. That is the world's way with the calamities of a devout man, whose humble cry, "My God," it resents as presumption or hypocrisy. But even these bitter sarcasms are less bitter than the remembrance of "happier things," which is his "sorrow's crown of sorrow." Yet, with the strange but universal love of summoning up remembrance of departed joys, the psalmist finds a certain pleasure in the pain of recalling how he, a Levite, led the festal march to the Temple, and in listening in fancy again to the shrill cries of joy which broke from the tumultuous crowd. The form of the verbs "remember" and "pour out" in ver. 4 indicates set purpose. The higher self arrests this flow of self-pity and lamentation. The feminine soul has to give account of her moods to calmer judgment, and to be lifted and steadied by the strong spirit. The preceding verses have given ample reason why she has been dejected, but now she is summoned to repeat them to a judicial ear. The insufficiency of the circumstances described to warrant the vehement emotions expressed is implied in the summons. Feeling has to vindicate its rationality or to suppress itself, and its grounds have often only to be stated to the better self, to be found altogether disproportioned to the storm they have raised. It is a very elementary but necessary lesson for the conduct of life that emotion of all sorts, sad or glad, religious or other, needs rigid scrutiny and firm control, sometimes stimulating and sometimes chilling. The true counterpoise to its excess lies in directing it to God and in making Him the object of hope and patient waiting. Emotion varies, but God is the same. The facts on which faith feeds abide while faith fluctuates. The secret of calm is to dwell in that inner chamber of the secret place of the Most High, which whoso inhabits "heareth not the loud winds when they call," and is neither dejected nor uplifted, neither disturbed by excessive joys nor torn by anxieties. Ver. 5 has the refrain in a form slightly different from that of the other two instances of its occurrence (ver. 11 and xliii. 5). But probably the text is faulty. The shifting of the initial word of ver. 6 to the end of ver. 5, and the substitution of My for His, bring the three refrains into line, and avoid the harsh expression "help of His countenance." Since no reason for the variation is discernible, and the proposed slight change of text improves construction and restores uniformity, it is probably to be adopted. If it is, the second part of the psalm is also conformed to the other two in regard to its not beginning with the Divine name. The break in the clouds is but momentary, and the grey wrack fills the sky once more. The second part of the psalm takes up the question of the refrain, and first reiterates with bitter emphasis that the soul is bowed down, and then pours out once more the stream of reasons for dejection. But the curb has not been applied quite in vain, for throughout the succeeding verses there is a striking alternation of despondency and hope. Streaks of brightness flash through the gloom. Sorrow is shot with trust. This conflict of opposite emotions is the characteristic of the second part of the psalm, while that of the first part is an all but unrelieved predominance of gloom, and that of the third an all but undisputed victory of sunshine. Naturally this transition strophe is marked by the mingling of both. In the former part, memory was the handmaid of sorrow, and came involuntarily, and increased the singer's pain; but in this part he makes an effort of will to remember, and in remembrance finds an antidote to sorrow. To recall past joys adds stings to present grief, but to remember God brings an anodyne for the smart. The psalmist is far from the sanctuary, but distance does not hinder thought. This man's faith was not so dependent on externals that it could not come close to God while distant from His temple. It had been so far strengthened by the encouragement of the refrain that the reflux of sadness at once rouses it to action. "My soul is cast down; . . . therefore let me remember Thee." With wise resolve he finds in dejection a reason for nestling closer to God. In reference to the description of the psalmist's locality, Cheyne beautifully says, "The preposition 'from' is chosen (rather than 'in') with a subtle purpose. It suggests that the psalmist's faith will bridge over the interval between himself and the sanctuary: 'I can send my thoughts to Thee from the distant frontier'" (in loc.). The region intended seems to be "the north-eastern corner of Palestine, near the lower slopes of Hermon" (Cheyne, u.s.). The plural "Hermons" is probably used in reference to the group of crests. "Mizar" is probably the name of a hill otherwise unknown, and specifies the singer's locality more minutely, though not helpfully to us. Many ingenious attempts have been made to explain the name either as symbolical or as a common noun, and not a proper name, but these need not be dealt with here. The locality thus designated is too far north for the scene of David's retreat before Absalom, unless we give an unusual southward extension to the names; and this makes a difficulty in the way of accepting the hypothesis of the author's having been in his retinue. The twofold emotions of ver. 6 recur in vv. 7, 8, where we have first renewed despondency and then reaction into hope. The imagery of floods lifting up their voices, and cataracts sounding as they fall, and breaking waves rolling over the half-drowned psalmist has been supposed to be suggested by the scenery in which he was; but the rushing noise of Jordan in its rocky bed seems scarcely enough to deserve being described as "flood calling to flood," and "breakers and rollers" is an exaggeration if applied to any commotion possible on such a stream. The imagery is so usual that it needs no assumption of having been occasioned by the poet's locality. The psalmist paints his calamities as storming on him in dismal continuity, each "flood" seeming to summon its successor. They rush upon him, multitudinous and close following; they pour down on him as with the thunder of descending cataracts; they overwhelm him like the breakers and rollers of an angry ocean. The bold metaphors are more striking when contrasted with the opposite ones of the first part. The dry and thirsty land there and the rush of waters here mean the same thing, so flexible is nature in a poet's hands. Then follows a gleam of hope, like a rainbow spanning the waterfall. With the alternation of mood already noticed as characteristic, the singer looks forward, even from the midst of overwhelming seas of trouble, to a future day when God will give His angel, Mercy or Loving-kindness, charge concerning him and draw him out of many waters. That day of extrication will surely be followed by a night of music and of thankful prayer (for supplication is not the only element in prayer) to Him who by His deliverance has shown Himself to be the "God of" the rescued man's "life." The epithet answers to that of the former part, "the living God," from which it differs by but one additional letter. He who has life in Himself is the Giver and Rescuer of our lives, and to Him they are to be rendered in thankful sacrifice. Once more the contending currents meet in vv. 9 and 10, in the former of which confidence and hope utter themselves in the resolve to appeal to God and in the name given to Him as "my Rock"; while another surge of despondency breaks, in the question in which the soul interrogates God, as the better self had interrogated her, and contrasts almost reproachfully God's apparent forgetfulness, manifested by His delay in deliverance, with her remembrance of Him. It is not a question asked for enlightenment's sake, but is an exclamation of impatience, if not of rebuke. Ver. 10 repeats the enemies' taunt, which is there represented as like crushing blows which broke the bones. And then once more above this conflict of emotion soars the clear note of the refrain, summoning to self-command, calmness, and unfaltering hope. But the victory is not quite won, and therefore Psalm xliii. follows. It is sufficiently distinct in tone to explain its separation from the preceding, inasmuch as it is prayer throughout, and the note of joy is dominant, even while an undertone of sadness links it with the previous parts. The unity is vouched by the considerations already noticed, and by the incompleteness of Psalm xlii. without such triumphant close and of Psalm xliii. without such despondent beginning. The prayer of vv. 1, 2, blends the two elements, which were at war in the second part; and for the moment the darker is the more prominent. The situation is described as in the preceding parts. The enemy is called a "loveless nation." The word rendered "loveless" is compounded of the negative prefix and the word which is usually found with the meaning of "one whom God favours," or visits with loving-kindness. It has been much disputed whether its proper signification is active (one who shows loving-kindness) or passive (one who receives it). But, considering that loving-kindness is in the Psalter mainly a Divine attribute, and that, when a human excellence, it is regarded as derived from and being the echo of experienced Divine mercy, it is best to take the passive meaning as the principal, though sometimes, as unmistakably here, the active is more suitable. These loveless people are not further defined, and may either have been Israelites or aliens. Perhaps there was one "man" of special mischief prominent among them, but it is not safe to treat that expression as anything but a collective. Ver. 2 looks back to xlii. 9, the former clause in each verse being practically equivalent, and the second in xliii. being a quotation of the second in ver. 9, with a variation in the form of the verb to suggest more vividly the picture of weary, slow, dragging gait, fit for a man clad in mourning garb. But the gloomier mood has shot its last bolt. Grief which finds no fresh words is beginning to dry up. The stage of mechanical repetition of complaints is not far from that of cessation of them. So the higher mood conquers at last, and breaks into a burst of joyous petition, which passes swiftly into realisation of the future joys whose coming shines thus far off. Hope and trust hold the field. The certainty of return to the Temple overbears the pain of absence from it, and the vivid realisation of the gladness of worshipping again at the altar takes the place of the vivid remembrance of former festal approach thither. It is the prerogative of faith to make pictures drawn by memory pale beside those painted by hope. Light and Troth--i.e., Loving-kindness and Faithfulness in fulfilling promises--are like two angels, despatched from the presence-chamber of God, to guide with gentleness the exile's steps. That is to say, because God is mercy and faithfulness, the return of the psalmist to the home of his heart is sure. God being what He is, no longing soul can ever remain unsatisfied. The actual return to the Temple is desired because thereby new praise will be occasioned. Not mere bodily presence there, but that joyful outpouring of triumph and gladness, is the object of the psalmist's longing. He began with yearning after the living God. In his sorrow he could still think of Him at intervals as the help of his countenance and call Him "my God." He ends with naming Him "the gladness of my joy." Whoever begins as he did will finish where he climbed. The refrain is repeated for a third time, and is followed by no relapse into sadness. The effort of faith should be persistent, even if old bitternesses begin again and "break the low beginnings of content"; for, even if the wild waters burst through the dam once and again, they do not utterly wash it away and there remains a foundation on which it may be built up anew. Each swing of the gymnast lifts him higher, until he is on a level with a firm platform on which he can spring and stand secure. Faith may have a long struggle with fear, but it will have the last word, and that word will be "the help of my countenance and my God."